American consumers are plagued with First World problems. There appear to be too many online streaming platforms for consumption. The average consumer now subscribes to three streaming video services, and for the first time, more households are subscribing to streaming TV than to traditional cable, according to a new report from Deloitte. 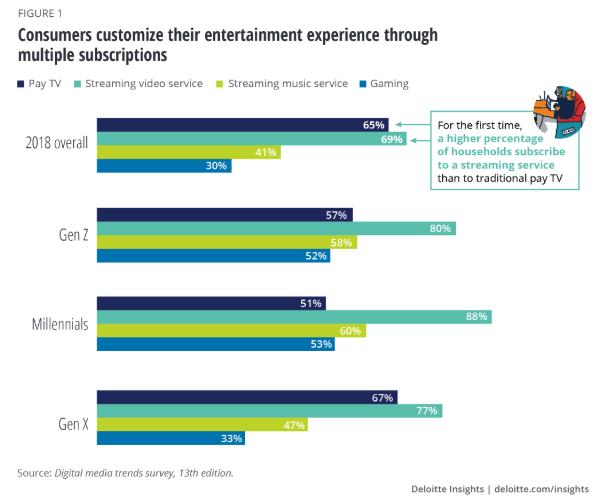 Deloitte’s 13th annual Digital media trends survey, conducted by Deloitte’s Technology department, discovered that 69% of households have at least one streaming video subscription, compared with 65% who have a cable subscription. The findings confirm that cord-cutting continues to accelerate, as households seek Netflix, Hulu and Amazon Prime as a cheaper alternative to cable and satellite packages. The survey found that many of the respondents subscribed to three streaming services and that binge-watching occurred on the regular, with 91% of millennials saying they have "Netflix and chilled." Deloitte said millions of consumers are gravitating toward streaming video services because of their high-quality, original content. About 57% of consumers have subscribed to streaming video services for the original content. The figure is much higher for millennials - coming in at 71%. 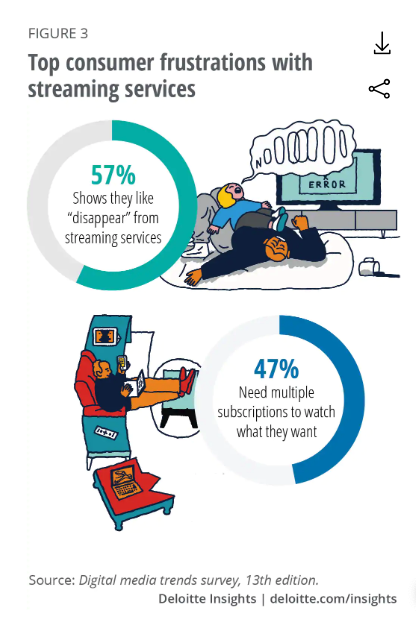 However, consumers experienced frustration with the abundance of content, 47% said they need more than two subscriptions to watch all of their shows, and 57% said shows that they have watched mysterious disappeared from streaming services. "With more than 300 over the top video options in the U.S., coupled with multiple subscriptions and payments to track and justify, consumers may be entering a time of 'subscription fatigue,'" said Kevin Westcott, vice chairman and U.S. telecom and media and entertainment leader, Deloitte LLP. "As media companies and content owners wrestle with how to retain and grow their subscriber base, they should not only continue to strengthen their content libraries, quality, distribution and value, but also keep a close eye on consumer frustrations, including advertising overload and data privacy concerns." 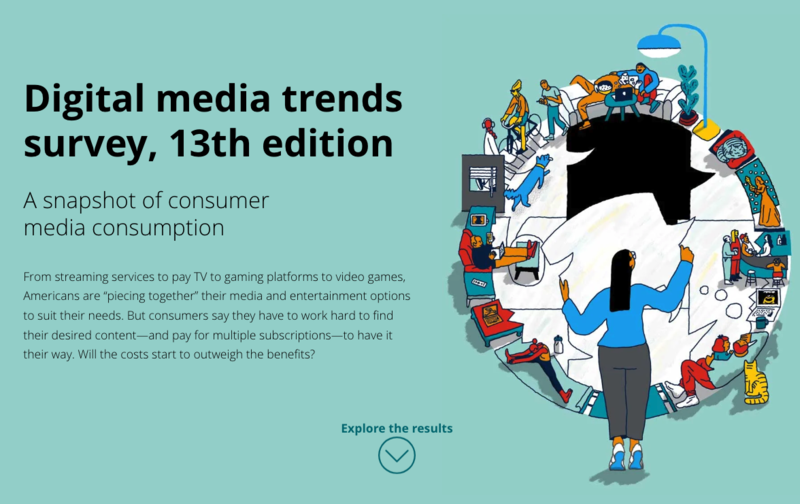 Despite the acceleration of cord-cutting, the survey also revealed that some consumers continue to pay for streaming and cable TV, with 43% of consumers having subscriptions to both. Deloitte's 2018 survey found that streaming video adoption breached the halfway mark in 2017 with 55% of consumers subscribing to streaming services. The trend is evident, cord-cutting is expected to explode this year through 2021. Traditional TV is doomed.